This painting is called The Death of Marat. It was painted by Jacques-Louis David in 1793 and currently hangs in Royal Museums of Fine Arts of Belgium, Brussels. 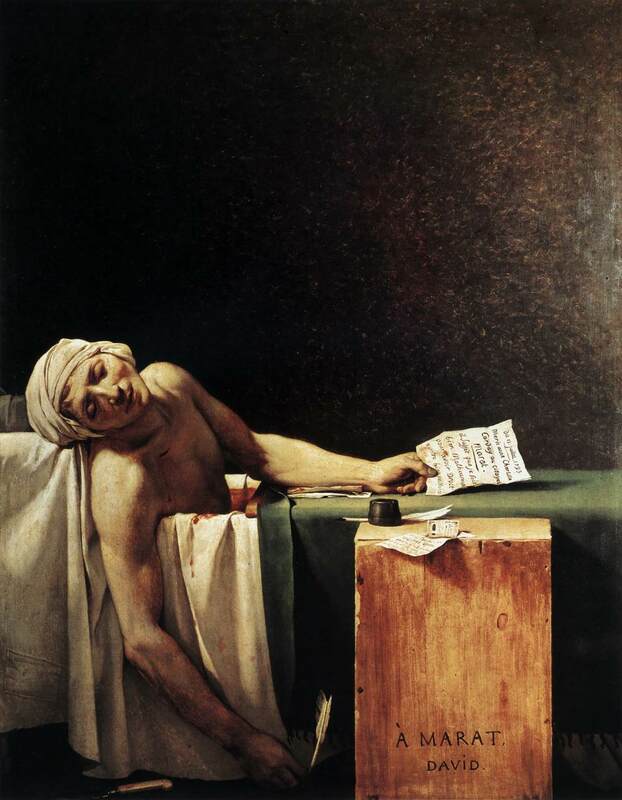 It depicts the aftermath of the murder of Jean-Paul Marat. Marat was a radical, aristocratic journalist at the time of the French Revolution and so was killed in his bath by a royalist. David was friends with Marat and was motivated to paint the scene to memorialize his friend. The painting is very stylized. There is no depiction of his skin disease. The paper and pen are still in his hands as if to suggest he died with purpose. His body is turned to face the viewer and his face and arms are highlighted. The background of the room is solid black so as to keep attention on the body and the death. These things are very complimentary of Marat. The violence is not occurring in the painting but its effects are the main focus. The bathtub is filled with blood. There is a long cut over his carotid artery on the right side of his chest. The painting is about the death of Marat rather than the killing of Marat, which took place moments earlier. I interpret it as being slightly propagandizing but poignant at the same time. Marat was probably not a good person, but David cared enough to carry this image of him into the future. The style is the same as paintings of Christian martyrs, alluding to the desire of David to confer sacred qualities to revolutionaries. Though the violent act is not actually pictured, can this painting still be considered violent? It's fairly well known that David's intent was by no means a realistic depiction of Marat's murder. If so, he would've played attention to some little details and would've paid far less attention in making such an incredibly grandiose and dramatic painting. So no, this painting should not be construed as violent because it really isn't. One can look at David's Oath of the Horatii or the Intervention of the Sabine Women in a similar way. From these examples, it's about the death of a martyr, and yes, death may be implied, and the death is essential to cast such a dramatic light on this event, but it's really only about the end result and not the process it takes to get there.